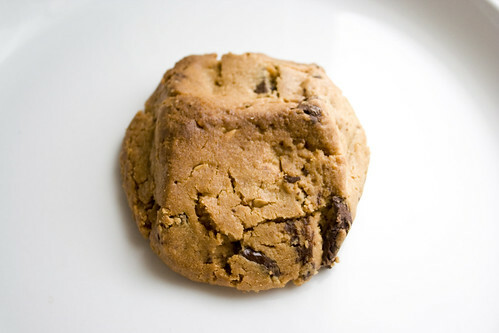 Don’t be fooled by that picture – it looks small, but that cookie measures 4 inches across and 1 inch thick. That’s a whole lotta cookie! Five years ago I was living in Chicago when someone gave me a cookie from Specialty’s, a cafe/bakery chain in the Loop neighborhood. He said, “I got a lemon tea cookie” and I think I instantly turned up my nose. Lemon? Who wants lemon for dessert? Well, I tried this cookie and it was fan-freaking-tastic. A little dry, but still soft with a sweet lemon flavor and a powdered sugar coating that melted in your mouth – it’s been a long time, but I still dream about that cookie. For whatever reason during all of my trips to Chicago over the last few years (and there have been many) I never visited Specialty’s myself. We were either too busy visiting other bakeries (hello, Molly’s!) or it was out of the way or something. Whatever the excuses, they weren’t good enough because these cookies are just as great as I remember. Taste Tester brought home a box full of 7 of these gigantic cookies – a couple snickerdoodle, a black and white, an oatmeal raisin, a milk chocolate chip and two peanut butter chocolates. He got them fresh baked in the morning and they made it home on the plane back to NJ in mint condition. He’s the best! Unfortunately he didn’t know the story of the beloved lemon cookie and I never (well, I guess almost never) eat lemon desserts so he wouldn’t have known to grab one of those. It’s okay, we’ll forgive him. For now. Clockwise from the left: milk chocolate, oatmeal raisin, two snickerdoodles and the peanut butter chocolate in the middle. I demolished the black and white pre-photo (a deep dark chocolate cookie with white chocolate chips), tasted the snickerdoodles (you can’t see but there’s a giant hunk missing from one where it’s hiding under the peanut butter chocolate cookie) and of course, tried one of the peanut butter chocolate cookies. It’s hard to pick a favorite. They are all really good. The peanut butter chocolate has big chunks of semi-sweet chocolate, is speckled with chopped peanuts and is jam-packed with intense peanut butter flavor. It’s slightly dry but not to the point where it’s crumbly or rock hard. It’s got a great texture and is so big, it could easily satisfy your chocolate peanut butter cravings for a couple days. Sadly there are no Specialty’s locations in the NY/NJ area :( but check their site because maybe there’s one near you. They even have a “Warm Cookie Radar” tracker on their site that shows which locations are baking up warm cookies. Awesome! See their full list of cookies here. Chocolate Peanut Butter Birthday Treats! “Warm Cookie Radar” are the best three words together EVER! There are two Specialty’s locations within walking distance of my downtown Seattle office. This is both good and bad–good because I love their cookies, muffins and bread, and bad for the same reason! :o) Until I read this August 2009 post about Specialty’s cookies, I had no idea they were in other cities besides Seattle. I wish I could find a peanut butter cookie recipe that came close to theirs! They are wonderful!